Thomas Wolfe is wrong – you can go home again. Recently, I visited my hometown for the weekend. It has been six years since my last visit, so I was curious as to the changes that transpired over time since growing up there. I did not grow up in some typical small town community. My hometown is a part of one of the largest cities in America – Los Angeles. To be specific, I was born and raised in the San Fernando Valley community of Reseda. Needless to say, I did not travel alone. I had a companion with me – an appropriate one. This one would be welcomed in the Reseda of my youth as it would today. 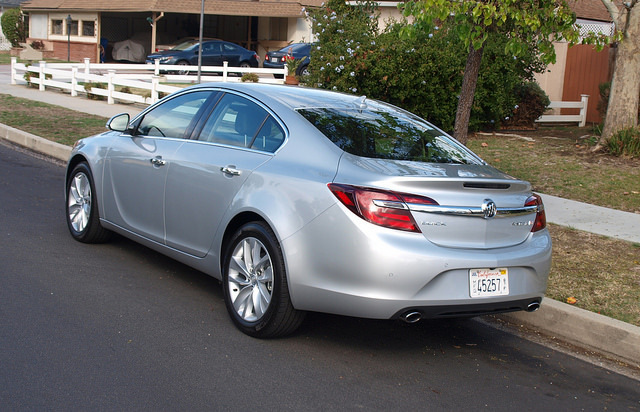 A silver 2014 Buick Regal became my trusted steed in this journey back home. It sat at an off-airport parking lot near LAX, waiting patiently for my arrival. It knew it had to do plenty of duty during its time with me. The facelifted Regal continues to be built on General Motors’ latest Epsilon platform, with a few nips and tucks away from being an Opel or Vauxhall in Europe. It has been the premium car of choice for Chinese consumers who would rather drive than be driven. Though it got lost in the shuffle between the Verano and LaCrosse, the update promises to help the Regal’s cause in North America by upping the power the base turbocharged engine, de-emphasizing the eAssist option and adding all-wheel drive to the mix. How did the Regal do as my ride in L.A.? The Regal made easy work of Los Angeles traffic. 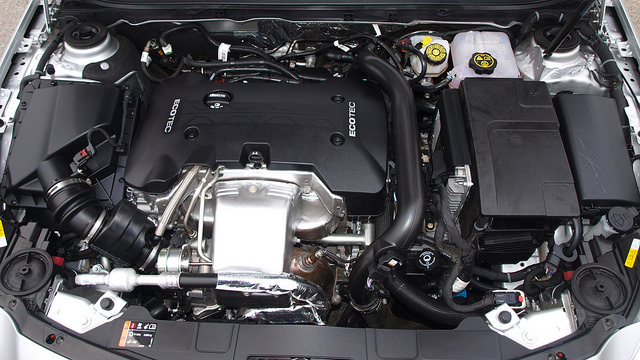 The reconstituted 2.0liter turbocharged Ecotec engine is now 259 horsepower – representing an increase for regular Regal models – along with 295 pounds-feet of torque. Connected to a six-speed automatic driving in the front wheels, you feel the turbo kick in a bit late, but it will definitely keep up with traffic. This combination yielded a fuel consumption figure of 23.7MPG. Stop-and-go traffic, merging skill, and quick responses are a part of Los Angeles driving. Most drivers you encounter have already sharpened reflexes to deal with quick decisions on and off the freeways. 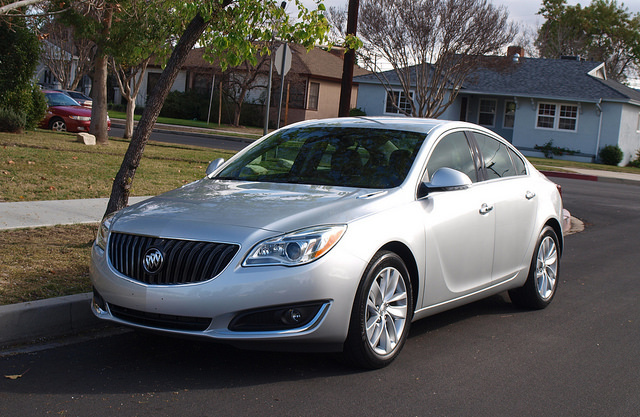 Sadly, you do hear the term “sig alert” on the radio – something that is repeated using XM Traffic via Buick’s Intelilink infotainment system. That is a term for when something went wrong – an accident where the wrong decision was made. Keeping the Regal on the road is its basic setup. There is a nice ride balance with stable handling throughout. There is minimal roll through the corners, but it might just feel soft overall with some feedback on “bouncy” road conditions. The steering is quite good, with some softness on-center and good reaction in tight maneuvers. Brakes give a solid feel with sure stops in both normal and panic situations. One thing I noticed is the severe lack of Regals on the road. I was clearly outnumbered by Mercedes-Benz C-Class sedans, BMW 3-Series, Audi A4s, Infiniti Q50s, and the Lexus IS. I found that I was clearly the only Regal on the road for hundreds of miles of driving. Perhaps this is a good thing. The Regal is a special kind of Buick. It is unlike the run-of-the-mill midsized sedan, where it would compete with the likes of the Mazda6, Kia Optima, and Ford Fusion along with the Acura TSX or the Volvo S60. One would argue that the “smaller” Verano fits in the Buick lineup better than the Regal. I point out that though it might attract the same customer, the Verano would appeal to more practical consumers while the Regal gets those who want a sportier sedan. The Regal offers three up on the Verano – the eAssist and all-wheel drive options and the GS setup. The latter is what attracts enthusiasts to the Regal. After driving the Verano Turbo briefly last year, I found there is an even greater advantage in the Regal – driver space. The leather seating is supportive and taut. I found a great place behind the wheel, which everything in front has changed. No longer are there big dials and a small switchable screen, as they yield to a more electric cluster with a larger information screen to boot. The center stack has changed with Buick’s new simplified cluster around the big Intelilink screen and new redundant switches on the steering wheel. After leaning my way through this setup in the LaCrosse, I got comfortable in the Regal navigating through radio presets, Bluetooth connection with the phone, and using the HVAC controls. Making the point of my having the only Buick Regal on the road made me wonder about whether it is cool or not. The exterior updates make the Regal even more handsome. The eighteen-inch alloy wheels and Michelin MXM4 Primacy tires finish out the look of this silver sedan. In my own mind, the 2014 Regal is cool. Yet, when having to share the Los Angeles freeway system with a huge foreign brand contingency – and a good number of Chrysler 300s – the Regal was indeed alone. Sure, the coolness factor would be easily raised if I had the GS. That is another animal in itself. To the tune of $34,685, this Premium II package kept me entertained across Southern California. Some may question the high price tag, but price out the top end of most mid-sized family sedans and check their performance numbers. Then, price out the lower end of the premium brand set where the Regal wants to compete against. You might find the Regal has a few advantages for the money. Los Angeles is where I learned how to drive. This place is where this work is rooted. Having the Regal on this assignment was the right choice for the job. Even when I wished for the GS model or HiPer Strut suspension to accomplish my driving better, this Regal was fitting to bridge the past with the experiences of my time in L.A. It made a great companion to witness the place where I grew up, the changes all around in the places I was once very familiar with, and to carry me for a family reunion eight years in the making. 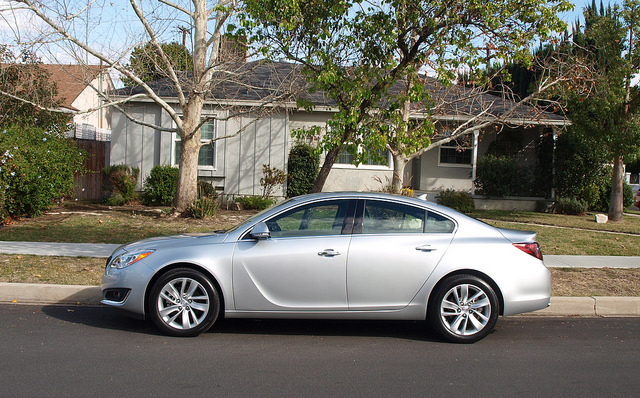 The 2014 Buick Regal in front of the house where Randy grew up. My brother and his family thought the Regal was cool. I value their opinion quite highly. I believe that speaks volumes against those who still think they need a higher priced luxury car similar in size to drive around Southern California in. This car works even better back here – the Twin Cities and the Upper Midwest, to be exact. For us, status is the least of our worries. But, if you must aspire for more in your life – or just want a nice sporty sedan to run around town in – the Regal is a solid choice.